I'm a treasure hunter. I dig through trash, scour thrift stores, go through friends and families belongings and always come home with something of a treasure. It is in my genes. My grandfather did the same thing, my mother does the same thing. It runs in my blood. I have feelings I identify as "cactus pan happy", "Pyrex chip bowl regret", and "out of my price stunned". My husband doesn't understand. He could live with 3 pairs of holey underwear (boxer briefs), 2 pairs of toddler painted pants and a few button up shirts, sans buttons on most. Lucky for me I know how to do laundry and sew, so he doesn't. But when it comes to my treasures he thinks I am a loon. But I have news for him, our 3 year old son is like me, and likes to thrift it up! Treasure Hunter Mini (THM) calls thrift stores, antique malls and any used goods store "the pretty store". After pretty Pyrex! Speaking of Pyrex, look at this little piece of treasure I found. A little vintage Pyrex ad I came across. 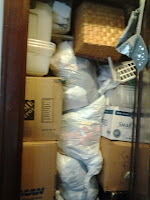 I have a small problem with stuff, but don't worry I'm also doing the great purge of 2012. Yard sale in 2 weeks! Come one come all and buy my stuff for I can make room for new stuff! See below .....problem with stuff. This is all to go bye bye soon at the yard sale.